Beer lovers will be very happy in Mexico. There are many brands to choose from and many will be familiar to beer drinkers around the world. I count myself as a beer lover and though I am no expert, I do have plenty of experience and plenty of opinions. Here is my take on Mexican beer. Disclaimer: The following is my opinion only. I tend to like darker beers, so I am favouring them here. I think light beer is a crime against society and consider anyone bringing Coors light or Bud anything into my home an act of war. I would love to hear your opinions, please email with your faves. Noche Buena: Unfortunately only available around Christmas. This is a darker bock with a full body and dry sweet taste. Available only in cases of 12 bottles. I stock up and am still sipping my last bottles in February. Negra Modelo: A darker brew. Nice taste. Best in the evening, not in the sun on the beach. You don’t want to be “pounding” this beer. Bohemia Beer: Brewed since 1900, Bohemia is a full flavoured, European style pilsner named in honour of the famous hop growing and beer brewing region of the Czech Republic. Not available everywhere. Dos Equis Amber: The darker brother of the popular Dos Equis. (Dos Equis means two letter X’s which you will see on the label.) If you are lucky, you might find this on tap in a few places. Yum. This is my “go to” beer for most occasions, sun or shade. You will not run into it everywhere. 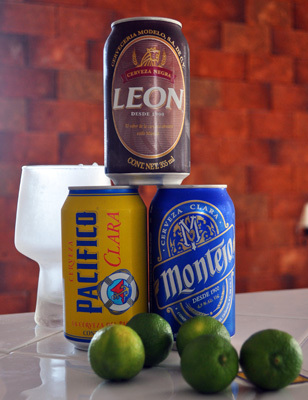 Montejo & Victoria: Pale lagers. Nice taste. Pacifico: Pale lager. Tastes crisp and light when at the beach. Very popular with the surfing crowd out west for years. Best to say “dude” when you order one. Dos Equis Lager: The lighter brother of Dos Equis Amber. Crisp and light. You can have a bucket of these and still be able to do simple math. Sol: Pretty similar to Corona, but better. Very light. Add a lime and drink it cold. Favoured by nine out of ten fishermen. Tecate: A simple lager. Seems to be only available in cans. Often a little cheaper than other brands. Corona Light: Now why on earth would anyone need a “light” version of Corona? Why not have “light water” instead?